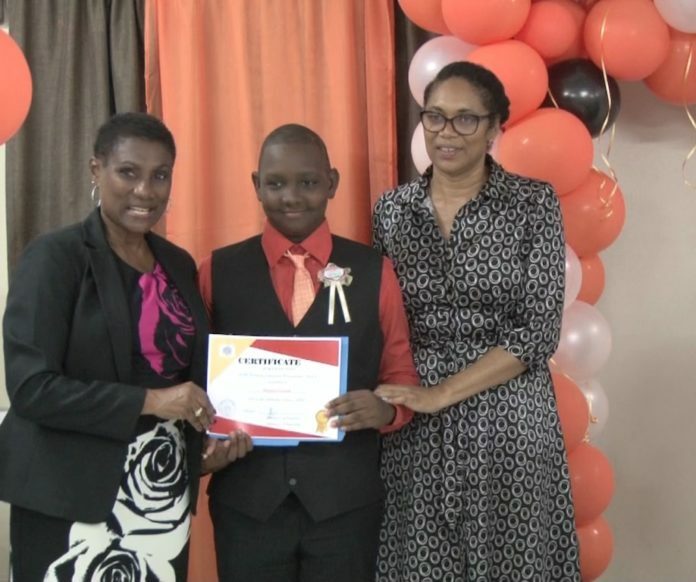 Photo: PS Henry-Morton, principal of the Dr. William Connor Primary School, and Valencia Syder pose with a student (center) receiving his participation certificate. Basseterre, St. Kitts – Fifty-five students from the Dr. William Connor Primary School benefited from the Ministry of Tourism’s Education and Awareness Programme, which is designed to sensitize students on the various careers within tourism, highlight the importance of tourism to national development and introduce students to ethical standards as it relates to the tourism sector in St. Kitts and Nevis. A week of activities was held June 26-29 to conclude the first phase of the programme at the school. Students were introduced to a number of events such as various careers in tourism presentations and etiquette training that ended with an etiquette banquet, which saw a number of students receiving participation certificates. Novelette Morton, senior projects officer in the Ministry of Tourism, said it was important to recognize the participants as they have done well throughout the three terms the programme was taught, covering topics such as what is tourism, the tourism product, the economic impact of tourism, what is sustainable tourism, tourism and culture, and careers in tourism. She gave a brief overview of the programme. Permanent Secretary Carlene Henry-Morton addressed the Etiquette Banquet on behalf of the Minister of Tourism, the Honourable Lindsay Grant, who expressed delight in seeing that the programme is fruitful. The permanent secretary also conveyed thanks on behalf of the minister to the management staff and students of the Dr. William Connor Primary School for “the willingness and enthusiasm with which they are partnering with the Ministry of Tourism to facilitate the delivery of the Tourism Education and Awareness Programme” at the school. “At the Ministry of Tourism, we are very strategic and deliberate in our outreach efforts, which are aimed at ensuring that our young people in particular, understand what tourism is about, how revenues generated by tourism contribute to the sustainable development of the sector, to the social and economic welfare of this nation and to the high standards of living we want to continue to enjoy as a proud people,” she said. The programme was also rolled out at the Sandy Point Primary School, the Basseterre High School and the Advanced Vocational Education Centre (AVEC).